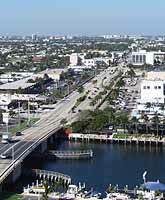 The aerial view shows the miles of sandy beaches, convenient access to the Intracoastal Waterway and location of The Plaza at OceanSide in conjunction with downtown Ft. Lauderdale. Sales hours are until 6pm. Taking I-95 Southbound: Take exit 36A for East Atlantic Blvd. Go east on East Atlantic Blvd for approx. 2.6 miles. Turn left at Ocean Blvd./SR-A1A. The Plaza at OceanSide will be on your left. Taking I-95 Northbound: Take exit 36A to merge onto East Atlantic Blvd/SR-814 E. Head east for approx. 2.6 miles. Turn left at Ocean Blvd/SR-A1A. The Plaza at OceanSide will be on your left.